Ambitious plans for the 116-year-old Dunedin Prison have been locked down, with confirmation the historic property has been sold to a trust intent on transforming it into a tourist attraction. The Dunedin Prison Charitable Trust has bought the property for an undisclosed sum, after Ngai Tahu deferred its first right of refusal to buy the surplus Crown property. It was envisioned the first stage could be completed by the end of next year to capitalise on the cruise-ship market, and the prison’s location between the Dunedin Railway Station and the upgraded Otago Settlers Museum. Trust chairman Stewart Harvey said the sale was the culmination of a year of discussions between both parties, and the trust was “extremely grateful to Ngai Tahu for their generosity and co-operation”. The trust was now able to begin fundraising for the estimated $2.6 million needed for the first stage of the prison redevelopment; with the ground floor likely to include a cafe, office areas, function areas and a “prison experience” tour. Plans for the new Dunedin Prison were completed in 1892 by John Campbell (1857-1942), Government Architect. Modelled on New Scotland Yard, the prison was designed in a Queen Anne style including cupola domes, dormers, striped brick and Oamaru stone elevations, and fine detailing. The layout consisted of four blocks surrounding a central courtyard. Construction was delayed as the Dunedin community felt the central site could be better utilised. Work finally began, however, in 1895. The exterior was finished by April 1897 and on 16 June 1898 the prison was occupied. Great project to see come to fruition. Hopefully. Just one question. Are any of the trustees paid for their services or is it all voluntary? I noticed a comment on ODT online along the lines of questioning whether it was a business or a charity and, if the former, suggested the Trust go to a bank for a loan instead of the community. The comment made me wonder as I assumed everything to do with getting the project up and going was purely voluntary. Peter, all the comment at ODT Online told me was that the writer knows very little about the Dunedin Prison project or in fact any heritage redevelopment project taken on by charitable entities. There are sizeable advantages to maintaining charitable status for project feasibility and fundraising purposes, as well as project development during stages of capital spend; and clearly there are business mechanisms including taxation requirements that demand legal change of status once there is a for-profit going concern in place. Stewart Harvey is a retired chartered accountant with proven expertise and success in project management and fundraising. It also strikes me that the writer of the comment knows little about Stewart’s considerable credentials and business networks; or the professional advice he takes in the course of any major project he initiates and sees through to fruition. It may be a “business” in the sense of being expected to pay its own way when it’s all set up, unlike the Fubar. Until then it needs money spent on it. Since it is a building many people want to see preserved for its heritage value, which in practical terms means re-used somehow, I see justification for people being asked to contribute – if they want to, again unlike the Fubar where the DCC made our contributions compulsory through rates. I have no gripe with trustees getting a fair recompense for their time and efforts – but again unlike on the scale of any of the trust etc associated with the Fubar. I support transparency. I hope these guys are totally different from all those associated with the Fubar who come out in ugly lumps at the very whisper of the word. Re the old prison, I was wondering whether the cells would be of use – including affordable – for writers both creative and academic e.g. thesis. Home is great but it may be hard to get peace and quiet, it may be impossible to leave one’s books in place overnight because it’s shared space. Some long-term “tenants” would keep to steady the income flow into the trust and maybe these rooms could be let fairly early before being greatly done up, to get early cash flow. Does this sound reasonable to others? Sounds reasonable to me, Hype. I’d also like to see a working wing of the prison to house non violent ‘white collar’ criminals where we can see an interactive display, watching them shuffling around with leg irons and breaking rocks. I’ve got a better idea. One of the most tedious parts of completing a thesis is getting all the references not only correct but into the prescribed style. Commas, upper/lower case letters, journals quoted with year, date if several published per year, page etc etc all in the correct order. Picky time-consuming tedious work. White collar workers could do that. It’s the kind of mind-numbing stuff that you nonetheless have to concentrate on so as not to make a mistake – more of a punishment than breaking rocks which allows a person to exercise the body and build up physical fitness while the mind is free to roam. That’s good to know Stewart Harvey is there to keep a steady ship. More reassured. Now you really are on to it, Hype, with your obviously creative talent for meting out punishment. Maybe you could volunteer for a position as a screw in the prison. One of the really nasty ones. I take it you’d love the uniform too. The historic Dunedin Prison was sold for $20,000, it has been revealed. The property, which has a capital value of $1.77 million, was sold to the Dunedin Prison Charitable Trust this week, after Ngai Tahu deferred its first right of refusal to buy the surplus Crown property. While the trust and the iwi declined to release the sale price, Land Information New Zealand (Linz) Crown Property Management acting manager John Hook confirmed a sale price of $20,000, plus GST, if any. Trustee Sarah Girvan told the Otago Daily Times the trust bought the prison from the Department of Corrections with $20,000 from sponsors. Those sponsors included the Southern Trust, Otago Community Trust, the New Zealand Historic Places Trust [Otago Branch Committee and McKay Bequest Fund], the Dunedin Heritage Fund, and a private anonymous sponsor. Saturday, 1 Sept 2012 1:39 p.m.
Dunedin heritage stalwart – Stewart Harvey has been recognised for ‘outstanding leadership in, and services to, the preservation, restoration and protection of Dunedin’s historic places’. A gathering of associates held on Wednesday 29 August witnessed Stewart receive the Certificate of Merit award from NZHPT South Island Board member Anna Crighton. Otago branch committee chairman, Daniel Pollard said of Stewart, “I consider him a heritage legend in this city and Dunedin is privileged to have him, not only that but he has phenomenal skills in being able to raise project money in record time”. A former Otago branch committee member, among his other exploits, Stewart is a founding Trustee and Chairman of the Historic Cemeteries Conservation Trust of New Zealand formed in 2002 to identify and preserve New Zealand’s historic cemeteries as part of the nation’s cultural heritage. In 2006 he initiated the first phase to restore the 130 year old Larnach Tomb located in Dunedin’s Northern Cemetery. The project was extremely ambitious yet through his exhaustive efforts, Stewart was instrumental in securing funding totalling $350,000 which saw the project completed “on time and in budget” in September 2011. 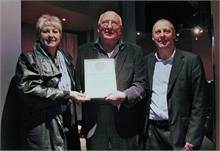 Larnach Tomb Restoration project won the Dunedin Heritage Awards: Heritage Interiors category in 2012. Otago/Southland Area Manager, Owen Graham describes Stewart as one of those ‘self-starters’ who knows how to link others into his projects, whether it be securing funding, or labour and resources. 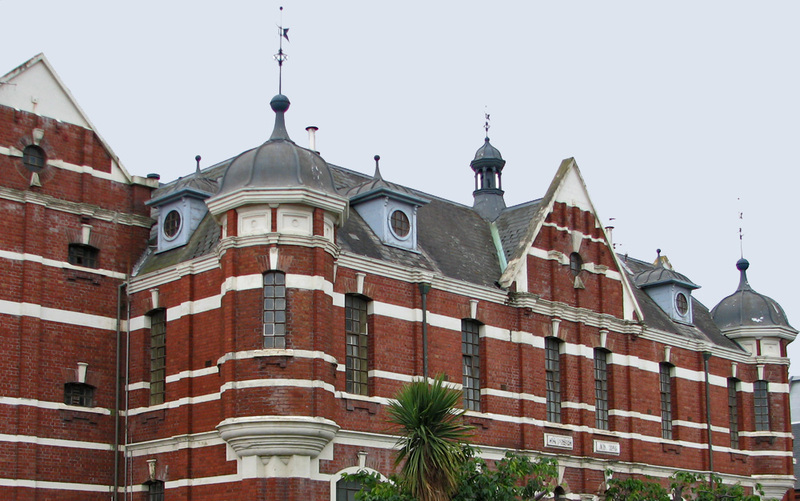 Stewart remains committed to the preservation of heritage in Dunedin City through his leadership of the Dunedin Prison Charitable Trust which has purchased the historic former Dunedin Prison for conversion into a major tourism attraction for the city. From next month the doors to the 116-year-old Dunedin Prison will be opened to those wanting a tour of the historic property. The Dunedin Charitable Trust bought the prison for $20,000 in June, after Ngai Tahu deferred its Treaty right to buy the surplus property. Trustee Sarah Girvan said while dates were not yet finalised, small group tours to see the “bare bones prison” were likely to begin next month for a donation of $10 per person. Donations would go towards the prison’s conservation plan – expected to begin in November – and which would “identify our next step in terms of redevelopment”. After being forced to follow the dishonourable behaviour of professional rugby and the OR F.U. it continues to surprise when reminded there are groups who can organise for a purpose and raise funding to achieve it. I know it happens everyday, everywhere but there is something about rugby bludgers in this city that blows it for everyone else. So what your really saying Peter is make it the new councillors’ office, just to get them used to it.